Regardless of the season, the City of St. John’s is a hub of activity, innovation and culture. With a variety of annual events and festivals, unique attractions, breathtaking land and seascapes, there’s something for everyone. Whether you’re here for a short stay or taking your time and exploring at a relaxed pace, there’s lots to do, see and discover. From outdoor adventure to annual events and festivals, attractions, scenic drives, shopping, fabulous restaurants and tours, St. John’s has it all. 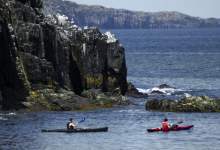 By day, travelers can easily explore nearby ecological reserves, world renowned Provincial and National Historic Sites, cultural and interpretative centres and hike urban and costal nature trails. In the evenings, enticing aromas and lively music drift through the streets renowned for their exciting nightlife. With easy access to wildlife, marine life, seabirds, whales and icebergs (in season), it’s easy to lose yourself while discovering St. John’s.